Cut refers to the shape of a diamond and to its proportions and finish. This is the one factor in releasing a diamond’s beauty for which man is responsible. A master craftsman plays a key role in releasing a diamond’s fire and brilliance. A diamond’s facets allow light to enter, become refracted, and exit in a display of light. 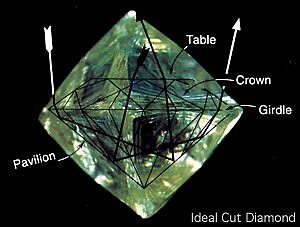 As illustrated, an ideal cut diamond will reflect light from one facet to another and disperse through the top of the stone, creating the maximum amount of fire and brilliance. 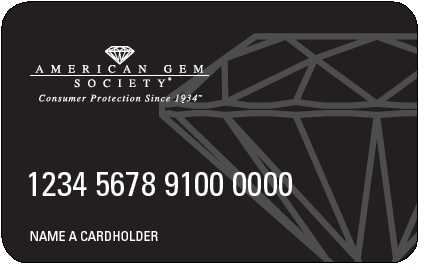 Improperly cut diamonds lose or leak light through the side or bottom, resulting in a compromised display of light. Consumers should be very aware of the importance of proper cutting as it can affect the value of a diamond by up to 40%. From one piece of rough a diamond has been cut to Ideal proportions, retaining a weight of one carat. The light is totally reflected through the top. The second piece of rough has been “spread” in its cutting, resulting in a diamond weighing approximately 1.40 ct. 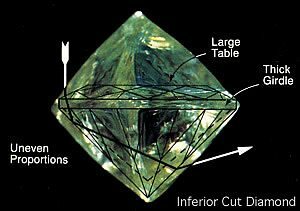 Note: The girdle is thicker, the table is much larger, the angles are exaggerated, all at the expense of that diamond’s ability to reflect light. Therefore, one can see that the value of a diamond can vary as much as 40% in the cutting alone. Colorless diamonds are more rare; most diamonds show a hint of either yellow or brown. Truly colorless, icy-white diamonds are extremely rare and therefore the most costly. Stones are graded by color and given designations dependant on how far they deviate from the purest white. GIA colorless stones begin at D and go through Z, while AGS begins their color scale at 0 and extends through10. The best way to see the true color of a diamond is by looking at it against a white surface. 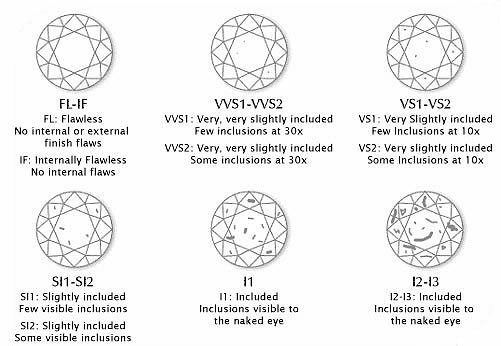 Flawless diamonds are more rare, however, most diamonds show internal characteristics called inclusions and external characteristics called blemishes. A diamond does not need to be flawless to be beautiful. Clarity is graded on a scale ranging from flawless to imperfect. Diamonds with clarity of SI2 or better do not have inclusions visible to the naked eye, and can be seen under magnification. See chart for both GIA and AGS grading scale. Larger diamonds are more rare than smaller diamonds. A one-carat diamond is more than twice the value of a half-carat diamond when all other factors are equal. Diamond’s weight is measured in ‘carats’. A carat is equal to 200 milligrams. It is the combination of grading for each of the 4 C’s that determines a diamond’s value. The 4 C’s all work in concert and merge in many combinations to establish a unique value for each individual diamond. As each of the 4C’s is assessed separately, the color, clarity, and carat weight are considered to be rarity factors; cut, however, is a beauty factor. Although it is more rare to find a beautifully cut diamond, it is the beauty of the stone that is the most important factor for the C of cut. We feel there should also be a 5th C when selecting a diamond. The 5th C stands for confidence in the jeweler you place your trust in.